301-942-2009Call today for a free no-obligation estimate. Your roof takes a beating. From winter’s snow and ice, to hail and blowing thunderstorms common in spring, to relentless summer sun, heat and humidity, your roof puts up with a lot of abuse. It’s amazing that the lifespan of the average asphalt shingled roof is 20 years, given the conditions. The biggest reason for roof replacement is damage to the shingles, which can cause one or more leaks in your home. Older homes, with more than one layer of shingles (re-shingled) will likely need a new roof as there has been previous damage in to the initial layer. Homes with visible structural roof damage may also need more significant repairs. However, if your roof is only a few years old, and your leaks have just become noticeable, and there’s no significant or structural damage, you may find that simple shingle repair is all that’s necessary. If you’re noticing water spots on your ceiling or you’ve noticed a distinct leak when it rains, don’t put off repair work — contact Dominion Roofing for shingle repair work immediately. Our shingle repairs are fast, reliable and affordable. Delaying repairs could lead to much more expensive and invasive repairs later! There are a few different types of damage to your roof that can be repaired quickly and easily. Missing or buckled asphalt shingles, flashing that has been damaged or blown off, and some minimal structural problems due to wind or hail, heat or ice, typically don’t require big bucks fix if caught soon enough. If you notice a leak, or other damage to your roof, you need to call Dominion Roofing right away. Dominion Roofing has been in business in Maryland for over 25 years. 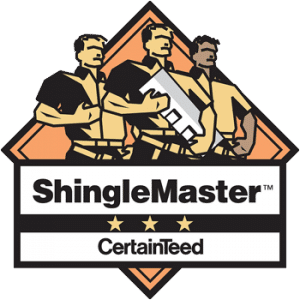 Thousands of satisfied customers have sought out the experience and knowledge of our shingle repair experts. In those years, we’ve pretty much seen it all, so rest assured that we can repair your roof’s shingles right the first time. Though your roof may last some 20 years or more, there’s a very good chance you’ll need asphalt shingle repair at some point. High winds and severe storms can cause your shingles to go missing. Weeks of snow and ice can damage the asphalt. Intense UV rays from the eastern summer sun, combined with humidity can cause everything from cracking to buckling. You may notice missing shingles or see that your roof is an eyesore before you notice any leaks. However, should you put off shingle repair, you will have leaks, and possibly water damage to your home. The only way to know how much damage your roof has sustained is by scheduling a roof inspection. Contact a roofing repair professional at Dominion Roofing at the first sign of asphalt shingle damage to avoid costlier repairs later on. It’s not always necessary to have your roof replaced. Most of the time, replacing your asphalt shingles will take care of your problem. 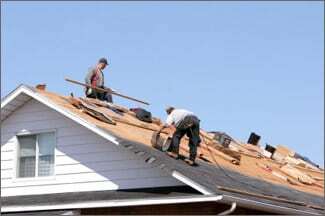 However, you’ll need a skilled and knowledgeable professional to get up on your roof and assess the damage for you. Asphalt shingle repair isn’t a DIY opportunity. In fact, if you aren’t a professional roofer, you could do more harm, and end up with a costly roofing job, instead of a simple shingle repair. Trust the experts at Dominion Roofing Co to inspect your roof and provide you with affordable and reliable shingle repair. We will do the job you need done and never try to “upsell” you a new roof. If you have apparent damage to your asphalt shingles and are in need of shingle repair, or if your roof is older and you’ve noticed some recent leaks, contact Dominion Roofing Co.
Herbert replaced my roof in 2006. It still looks great and has yet to leak. Herbert and crew are professional, efficient and pleasant to do business with. He is also fair in pricing. I highly recommend him. Bill was very prompt at providing an estimate and friendly and careful at ensuring our repair was precise and high quality. The crew was professional and efficient. Overall very good experience and well worth the very reasonable cost. I shopped around and nothing compared to the pricing quoted and the work was great and done wonderfully. Very professional and courteous. I will definitely recommend to anyone needing roofing work and will go back for any of our needs!